According to the JCS directive of 12 March 1944,* MacArthur's immediate duty following RECKLESS was to "conduct such operations along the New Guinea coast and such other operations as may be feasible in preparation for support of the Palau operation and the assault on Mindanao." To execute this mission MacArthur had been assigned most of the U.S. Army forces in the SOPAC, forces which would have to be transported to the SWPA and integrated into its command structure. Although Nimitz was supposed to assist SWPA as practicable, POA's operations in the Marianas meant that SWPA would have no fast carrier support and would be unable to borrow amphibious shipping to augment its own insufficient number of assault vessels. No exact timing had been indicated by the JCS for the remaining phase of the New Guinea campaign, but it had been stipulated that both SWPA and POA would be in positions permitting the invasion of southern Mindanao by MacArthur on 15 November 1944. SWPA thus committed its entire effort to an advance up the New Guinea coast along an exceedingly narrow front. Its four remaining operations in New Guinea would advance the land-based bombers by successive occupations of minimum air-base areas, selected in positions lightly held by the Japanese. Air power would prepare the way for each invasion and would protect SWPA's flanks, increasingly vulnerable as the attack moved northward. SWPA experience had demonstrated that air power could perform such a mission. The only question was whether the execution of four operations in as many months with the limited amount of amphibious shipping and engineering forces available would allow SWPA to reach the point of departure for the Philippines within the time allotted. fighter group, and two heavy bomber groups. GHQ directed Krueger and Whitehead to plan a program which would complete facilities by 27 July, and after studying the terrain, Hewitt and the TORNADO force engineer agreed that the only solution was to prepare a 6,500-foot strip and several large undispersed parking areas. The presence of all the indicated units at any one time would necessitate parking aircraft close together, thereby presenting a lucrative target to a Japanese night raider, but Whitehead, realizing that this could mean losses in both personnel and planes, agreed to take the risk. 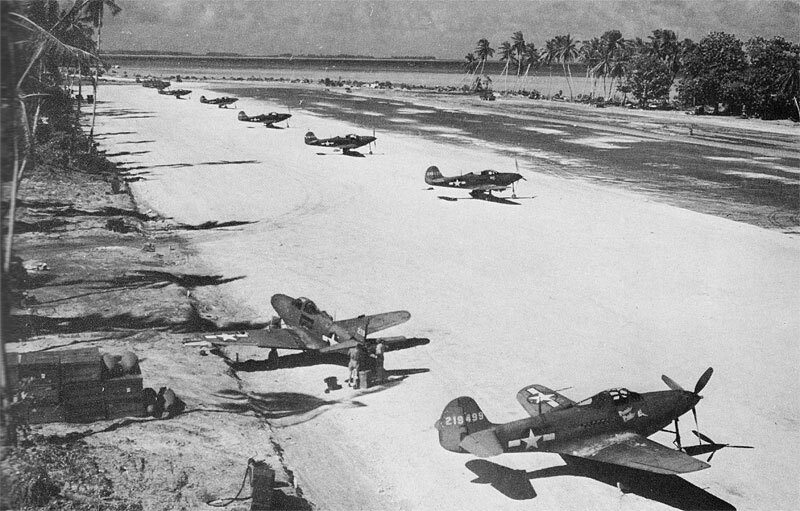 By 27 May the facilities were ready for use substantially as outlined by Hewitt.21 These facilities, so hurriedly completed, were imperfect (a dip near the center of the coral-surfaced runway caused a roller-coaster effect and became soft in heavy rains), but they would improve with more effort. The 8th Bombardment Squadron, flying its fifteen A-20's from Hollandia, operated more satisfactorily. On 19 May, twelve of these A-20's, sweeping in over Manokwari harbor in an early morning raid, destroyed or badly damaged seven or eight vessels, including one of 1,000 to 1,500 tons and another of 2,000 tons. Still having some ammunition left, the A-20's continued to their secondary target, Kamiri drome on Noemfoor, where they destroyed at least four grounded planes, heavily damaged five others, and strafed about 100 Japanese workers on the strip. P-38's of the 432d and 433d Squadrons covered the light bombers, and the latter squadron shot down a Rufe floatplane. 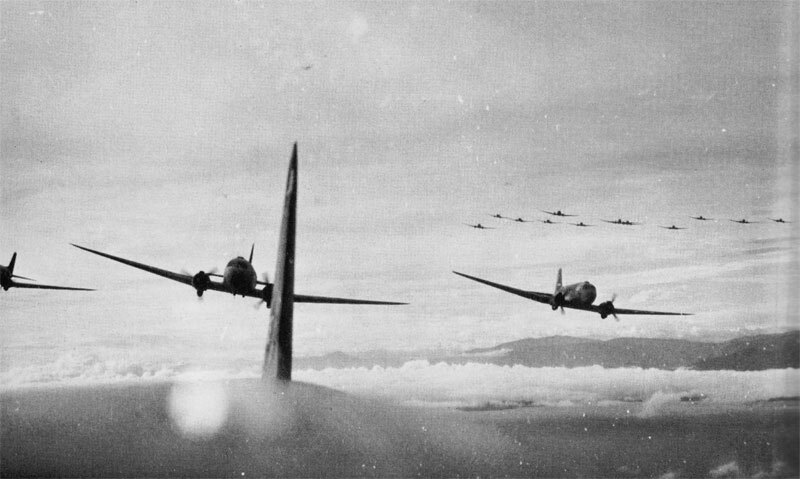 After being weathered out on 20 May, twelve A-20's virtually ignored Japanese gunners to make four bombing and strafing passes over Kamiri on the next day, destroying seven to eight grounded planes. 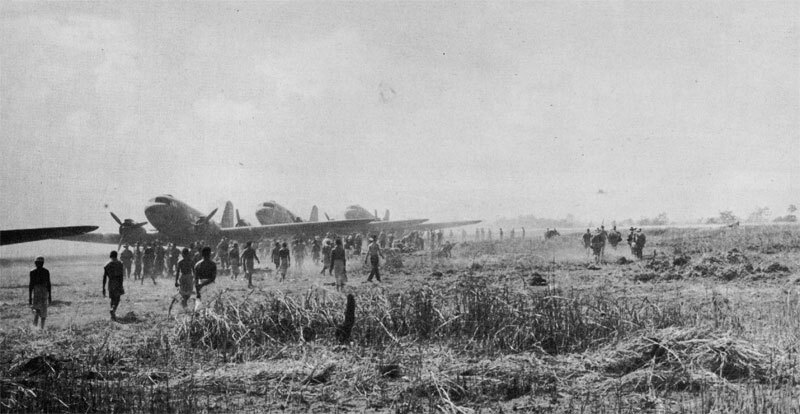 The next two days the light bombers were unable to reach their primary targets and attacked Biak, but on 24 May they swept Namber and Kamiri dromes, destroying ten additional planes on the ground.30 These raids were singularly effective in reducing the Japanese air potential and in breaking up shipping, but the single light bomber squadron lacked the bomb-carrying capacity to crater Japanese airfields on Noemfoor. As Fuller's comment suggests, the establishment of a beachhead at Bosnek proved not to be very difficult. The first echelon of the 41st Division had departed Hollandia on the evening of 25 May. 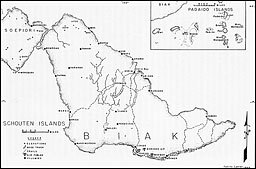 Naval covering forces joined the amphibious fleet next morning, and steaming directly toward Biak, with cover by fighter patrols from Hollandia and Wakde during the daylight hours of the 26th, the invasion fleet arrived off Bosnek on the early morning of 27 May. Following the naval and air bombardment, landing troops started ashore at 0715. 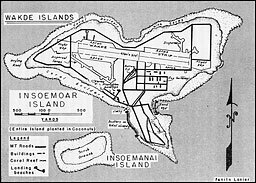 Once ashore, the 186th Infantry quickly established a beachhead, and the 162d Infantry, second in the debarking column of regiments, pushed speedily toward Mokmer village.37 Air cover was instituted shortly after first light by four 17th Reconnaissance Squadron B-25's, but the next two successive fighter patrols were blocked off by weather and scheduled air cover was not in place again until 1100. 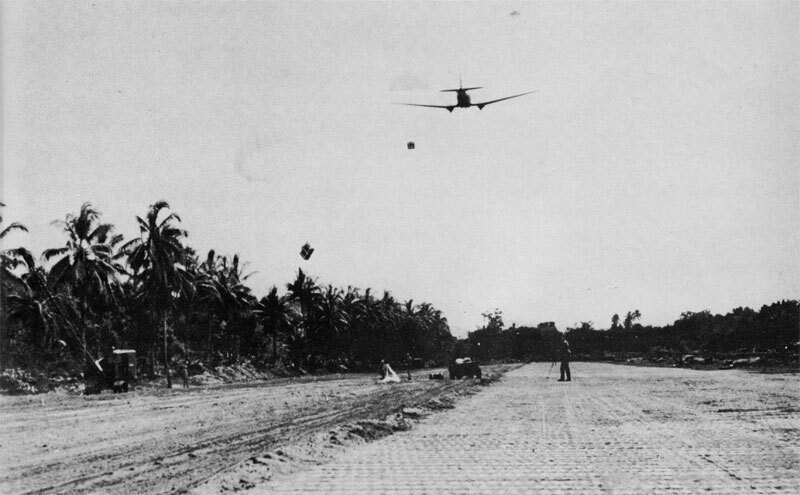 Thereafter, fighters rotated on patrol, encountering no enemy airborne opposition (although friendly AA sent up occasional bursts of flak) until late in the afternoon.38 Four squadrons of the 3d Group's A-20's, orbiting off Biak, furnished direct support on call, and the fighters, as they were relieved from patrol, strafed targets specified by the ground controller.39 Except for one A-20 shot down by enemy AA with the loss of its gunner, there were no aerial casualties during Z-day. 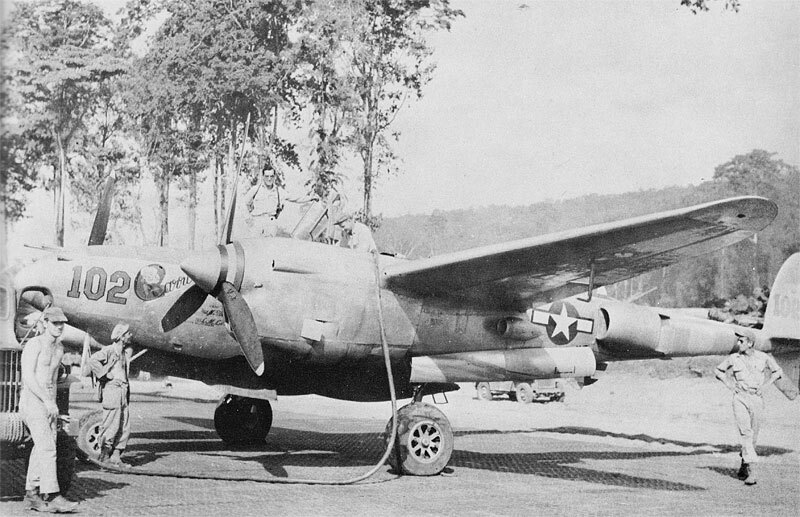 positions; but being forced to fly a steady course to sight their cannon, the B-25H's provided a good target and lost one of their number to AA.45 Light and medium bombers of the 3d Group and 17th Reconnaissance Squadron continued to give direct support on call, a business which was endangered by friendly AA gunners made "trigger happy" by Japanese activity. 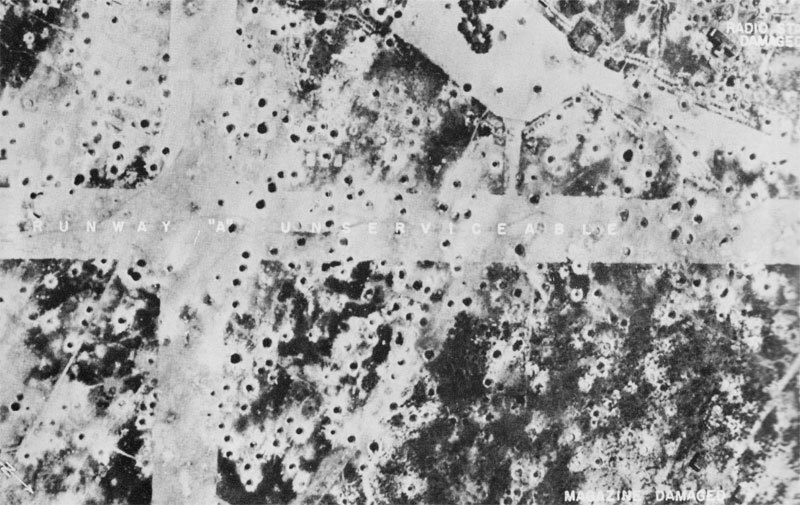 On 28 May the gunners had shot down a B-25 which had been cleared to drop pictures on the beachhead.46 Bad flying weather over Biak turned back all missions on 30 May but also gave the ground forces respite from hostile air attacks until late that evening. battleships and cruisers sailed from Davao on 2 June, but alarmed by submarine and search-plane sightings and erroneous reports of a powerful Allied naval force northwest of New Guinea, the battleships soon turned back. Two cruisers, six destroyers, and the troop transports continued to Sorong, where after some debate, the Japanese decided to use the six destroyers for a fast run into Biak. Three of the destroyers were loaded with 200 men each, and covered by the three other destroyers they left Sorong early on 8 June.49 Special intelligence and sightings had kept Allied forces well posted. While TF 74 and TF 75 went on alert, Whitehead on 4 June rushed a large concentration of aircraft to Wakde, but when planes of the 63d Bombardment Squadron located the main body of the enemy fleet steaming back north that night and sank a troop transport, the alert was relaxed. 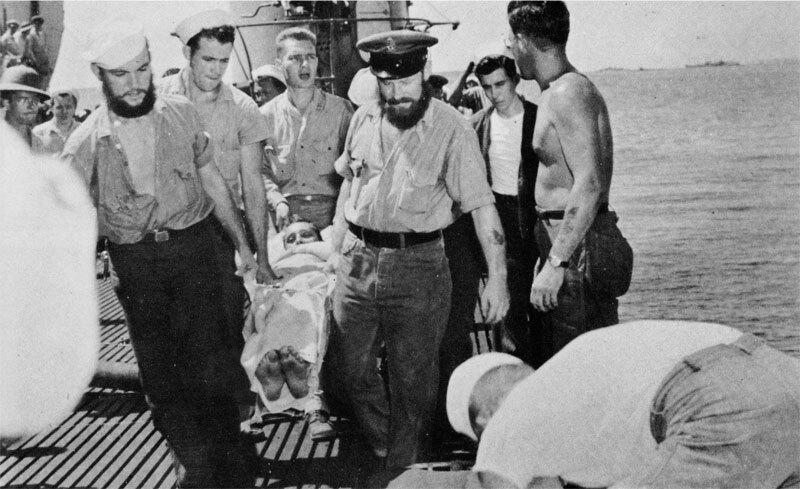 During the day a large formation of Japanese planes, sacrificing four of their number to P-47's, had holed the cruiser Nashville; after the alert, our naval forces moved back to safer waters at Hollandia.50 But continued reports, resulting from attacks by the 3d Group on Japanese barge concentrations at Manokwari, indicated that mischief was still afoot, and on 6 June, B-24's of the 380th Group located the Japanese cruisers hovering off Waigeo Island.51 The subsequent attack proved unsuccessful. equipment met the immediate tactical situation but contributed to one of the most confused logistical situations ever encountered by the Fifth Air Force. 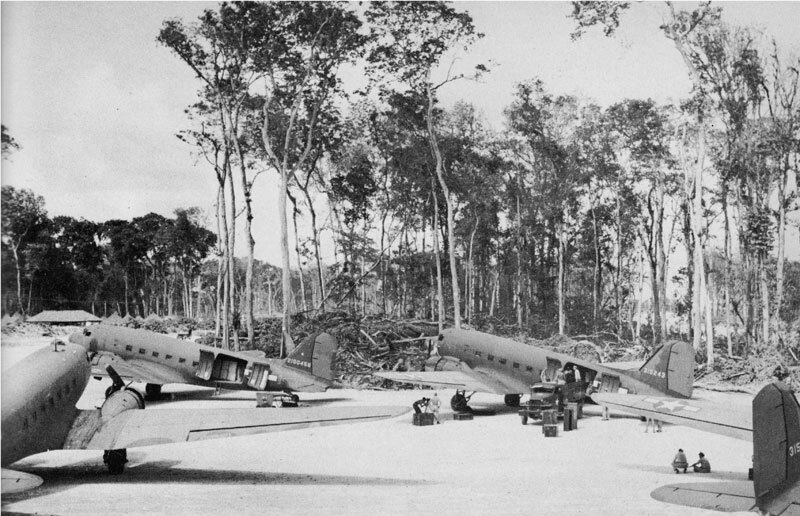 Proper maintenance was impossible, and by 3 August some ninety-one aircraft were grounded at Biak-Owi for want of repairs, reducing, in effect, by one full tactical group the potential striking force based forward.72 This unfavorable condition, moreover, was not limited to Biak-Owi. 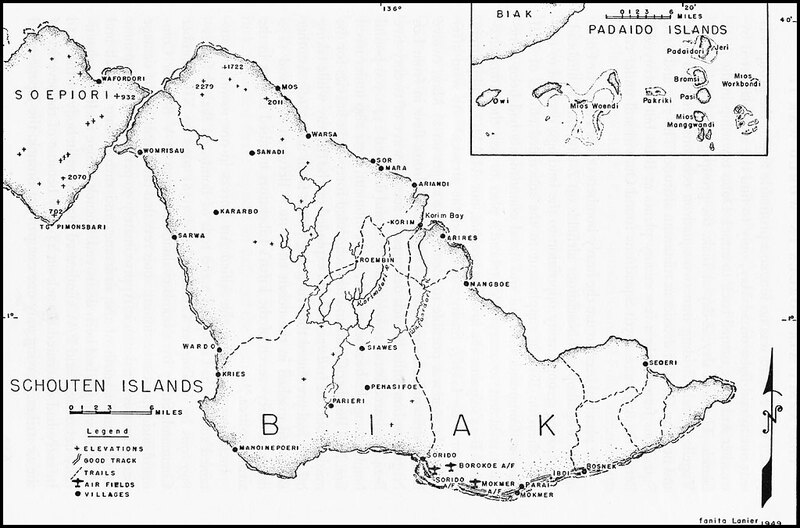 The 90th Bombardment Group, to take but one example, had set up an air echelon at Wakde on 22 June, a part of the ground echelon was aboard ship at Hollandia awaiting movement to Biak during most of July, while the rest of the ground echelon was at Nadzab, the official group station.73 Concentration of these scattered echelons at Biak and Owi would be one of the gravest problems confronting the Fifth Air Force during August and early September. During the three months following the JCS announcement of plans for liquidation of SOPAC forces, SWPA had been so busy with its New Guinea campaign that none but extemporized command arrangements had been practicable. These improvisations, however, suited a climate of opinion in SWPA that placed military operations ahead of the niceties of administration. *See Vol. I, p. 176 ff. memoranda during most of 1944, settling many matters on an informal basis. Kenney, moreover, had a high admiration for Whitehead, whom he considered "an essential member of a winning team which is producing maximum results with a minimum cost of personnel and equipment. "81 The two generals exchanged letters, often daily, when their command posts were separated. In general, FEAF would develop substantially as had been visualized, assuming more and more of the operational attributes of the Allied Air Forces until by September 1945 it was ready for the liquidation of the latter agency, a change planned to coincide with a redefinition of MacArthur's theater preparatory to the invasion of Japan but which actually would take place after V-J Day. This, however, will be a subject for later attention. To return to June 1944 and the New Guinea campaign, it may be observed that the reorganization had been accomplished smoothly and with no delay to the Allied war effort. *TF 74 and TF 75 would furnish cover and fire support, while TF 77, commanded by Admiral Fechteler, would embark troops at Toem and proceed so as to arrive off Noemfoor in time for H-hour (1800K) on 2 July. infantry gets in," he wrote Whitehead, "I would be willing to bet that the show would be a flop, but having a lot of faith in the thousand pound bomb and reading the continuous stream of reports of the Gloucesterizing going on I am not worried about it at all. "90 TABLETENNIS was a small operation, but if the Japanese defenders remained able to fight they could make it costly both in men and time for the Allies. 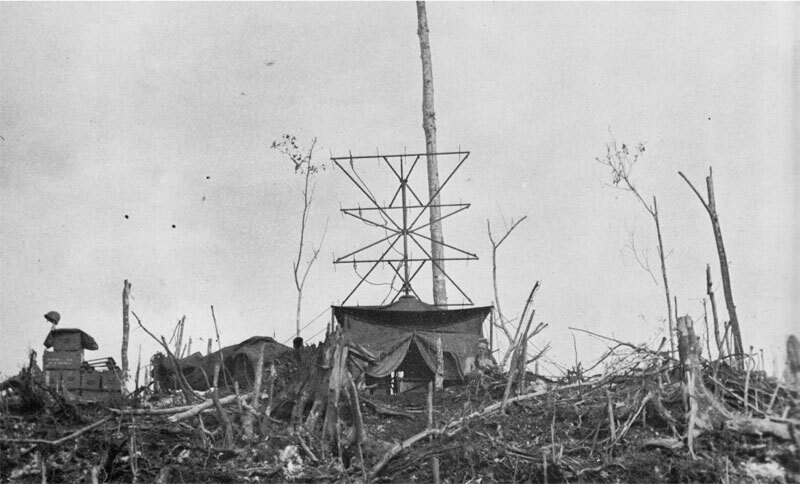 six enemy planes in northwestern New Guinea, of which probably no more than twelve were actually serviceable.92 Only the weather and the long distance from Nadzab hindered the neutralization of Noemfoor. Liberators had dropped their cargoes of 250-pound instantaneous demolition bombs precisely on Japanese ridge defenses and personnel areas overlooking the beachhead. Admiral Fechteler described their work as "the best example of coordination and timing yet achieved in the SWPA. "94 Proceeding ashore successfully in LVT's, the assault wave of the 158th RCT found that the Japanese had abandoned their beach defenses. The first defensive troops encountered, near the center of Kamiri strip, had been so badly stunned by the aerial and naval bombardment that they could offer little resistance. Throwing a perimeter defense around the airdrome, the 158th spent the rest of D-day cleaning huddles of dazed Japanese troops out of the caves east of the airdrome. A captured Japanese lieutenant and abandoned documents revealed that the Japanese commander had observed the soundings of the ALAMO Scouts and had anticipated an Allied landing at Kamiri early in July. 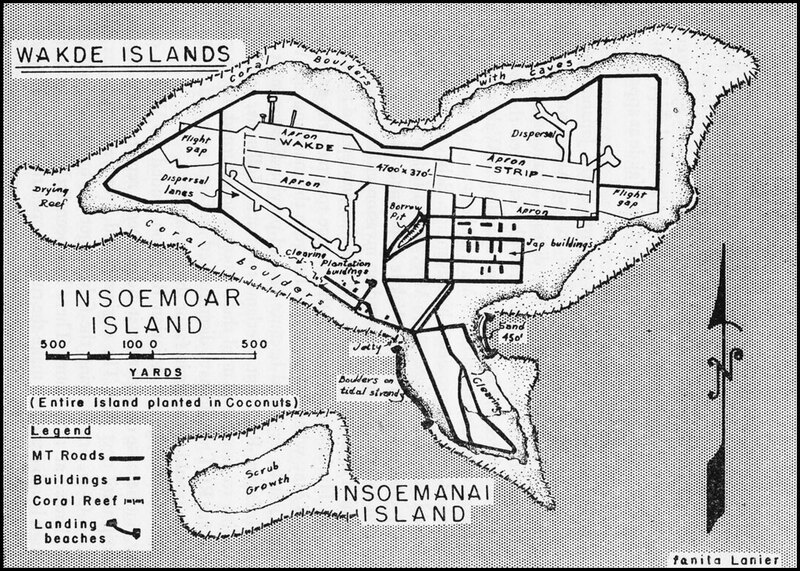 He had prepared defenses and registered weapons so as to destroy the landing forces on the reef, but his forces, their morale and combat efficiency already sapped by aerial bombings, collapsed under the immediate pre-invasion air and naval bombardment.95 The potentially hazardous landing at Noemfoor was thus accomplished practically without opposition. 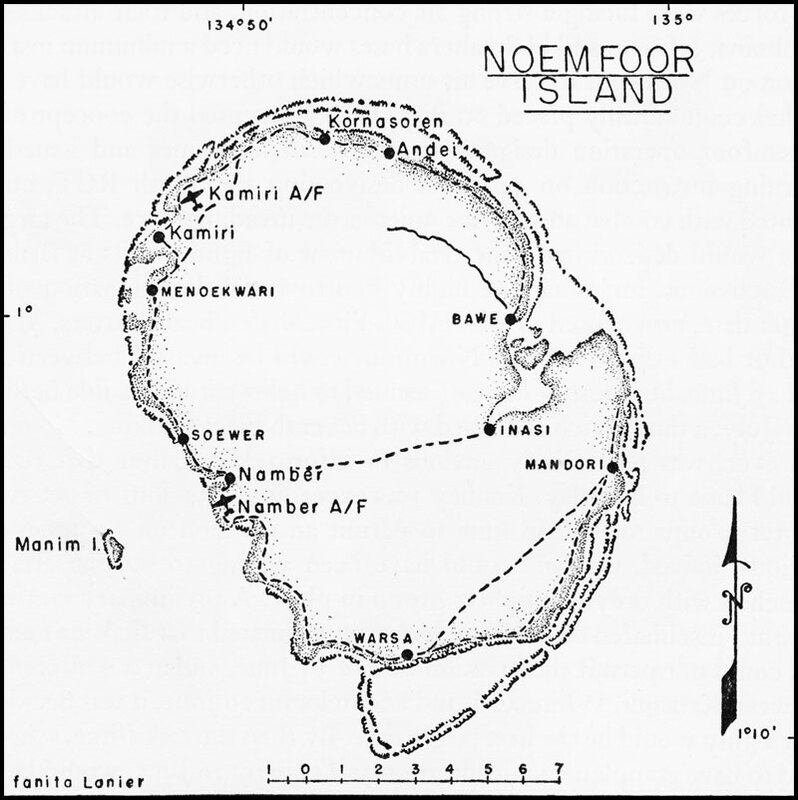 Construction of initial air facilities on Noemfoor had to be timed in relation to the Vogelkop operation scheduled for 30 July. Fortunately, construction could begin as soon as the engineers were ashore. The Japanese strips, unfortunately, were of little use. Kamiri was poorly surfaced with sand and clay and, instead of supposedly "extensive dispersals," had no more than ten hardstands. Kornasoren was "only a location." 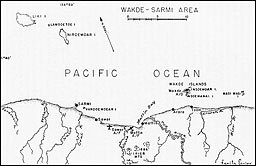 Namber strip was suitable for transports, but its utilization would require a supply route overland from Kamiri and construction of a standard airfield would be complicated by heavy standing timber and rugged terrain. 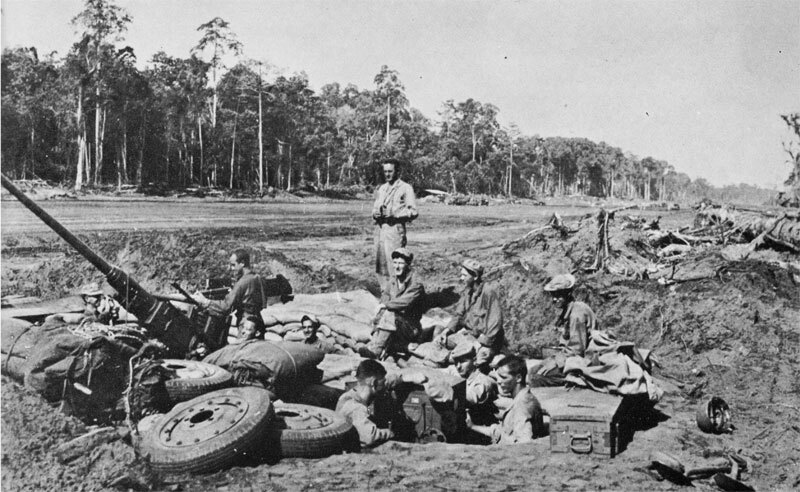 Work began at Kamiri on D-day, when the 27th Engineer Combat Battalion dragged lengths of Japanese railway irons behind trucks to smooth ruts and used abandoned rollers to begin compacting the strip. 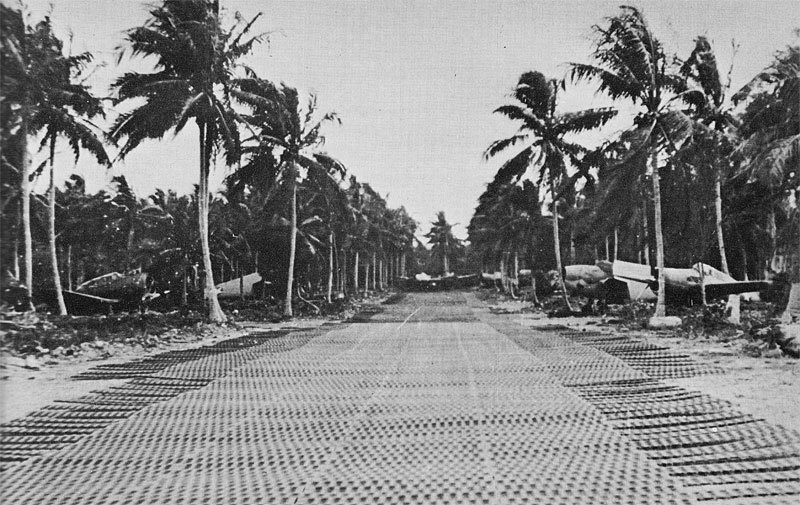 By 5 July the 1874th Engineer Aviation Battalion started 24-hour construction, and after a coral surfacing coat had been laid the strip was opened on 16 July for transport aircraft. 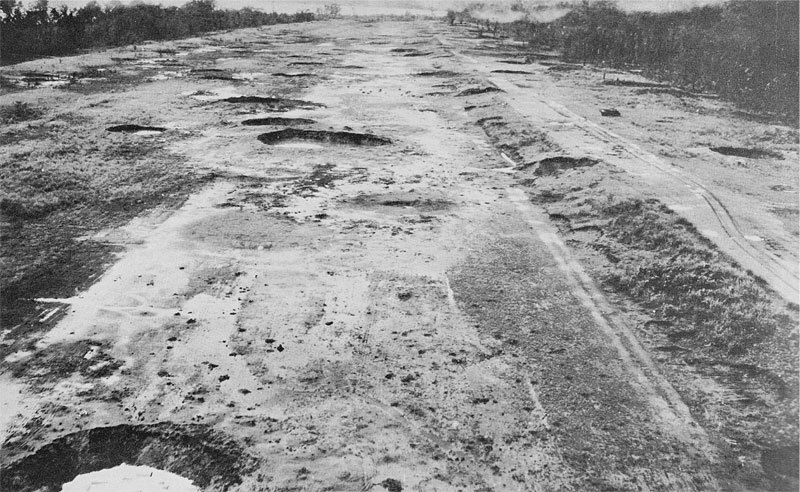 Work had not begun at Kornasoren when, without warning on 14 July, GHQ indicated that air plans to begin raids against the Halmaheras would require a serviceable strip and parking for fifty P-38's there by 25 July--this without slowing work at Kamiri--but the RAAF 62 Construction Wing, service units, and combat troops working together met the deadline. 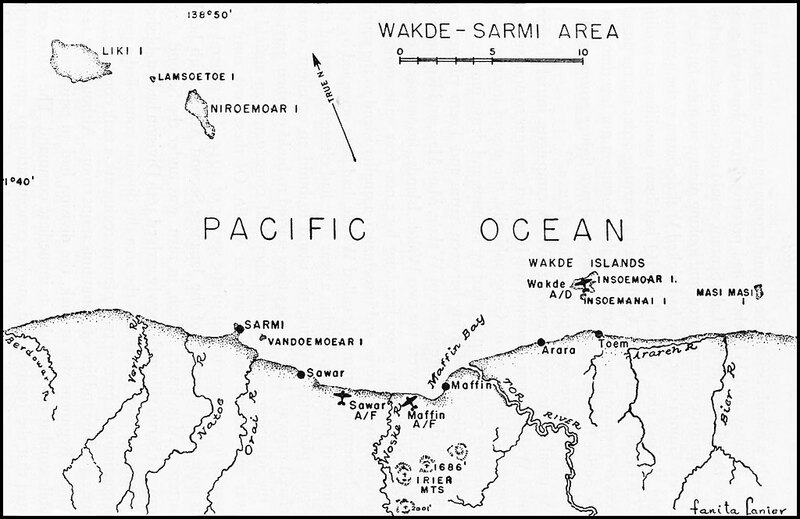 During August the Fifth Air Force and ALAMO would agree to forego a fighter-medium bomber field at Namber, reasoning that the engineering effort could better exploit a limited expansion at Kamiri and a large expansion at Kornasoren.102 But, after the middle of August, the base-construction program on Noemfoor became a factor in immediate pre-Philippine operations and will be discussed in a later volume. tons ALAMO predicted that the shipping backlog could not be cleared before the end of August. This tie-up both delayed the movement of air force units and hindered construction on Noemfoor. By 12 August air force movements into Noemfoor were 69 per cent behind schedule for troops, 76 per cent for vehicles, and 66 per cent for other impedimenta. An advanced detachment of 10 Operational Group went ashore on 4 July, and on 21-22 July, P-40's of the 78 Wing flew to Kamiri. 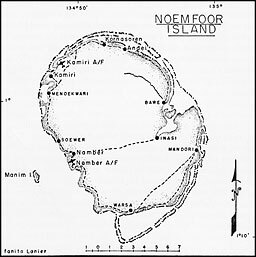 Waterborne echelons of the RAAF 22 and 30 Squadrons (77 Wing) were to have reached Noemfoor before 12 July, but these shipments could not be debarked until 24 July and 14 August and their Bostons and Beaufighters could not be accommodated at Kamiri before the middle of August. 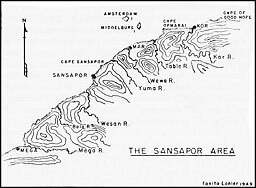 The American garrison was even more tardy, and when the advanced detachment of the 309th Bombardment Wing reached Kornasoren on 28 July, two days before D-day at Sansapor, it found only a detachment of the 419th Night Fighter Squadron in place. 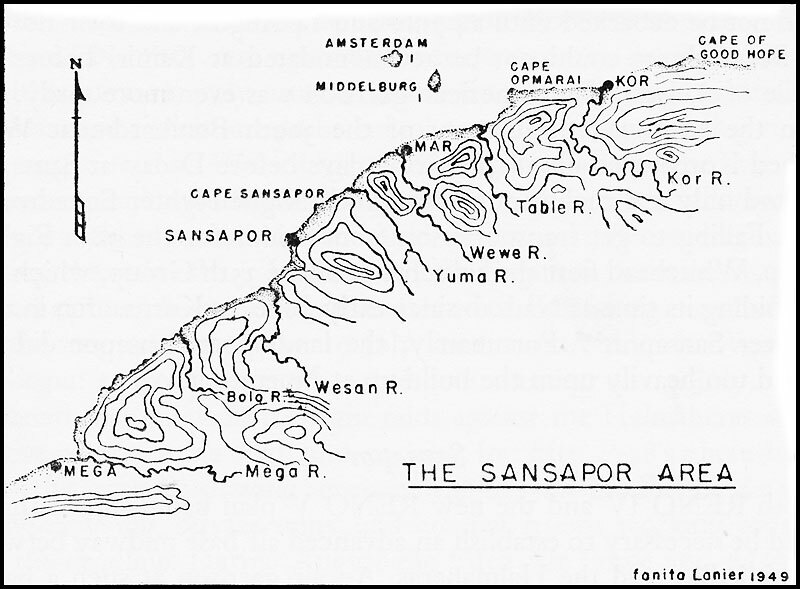 Failing to get transportation from Saidor for the 58th Fighter Group, Whitehead flew the air echelon of the 35th Group, which had been biding its time at Nadzab since early June, to Kornasoren in time to cover Sansapor.103 Fortunately, the landing at Sansapor did not depend too heavily upon the build-up at Noemfoor. General Barnes landed behind the assault troops on D-day and immediately inspected sites near Mar village (just east of the Wewe River), on Amsterdam, and on Middelburg. By D plus 1, he had decided that a fighter airdrome could be built on Middelburg and that the medium bomber fields should be built at the Mar site. 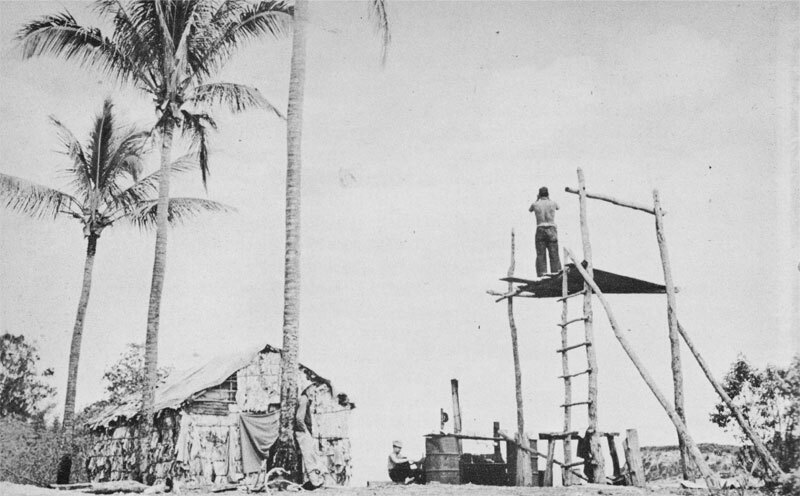 In spite of difficulties inherently connected with the construction of an airstrip on a small, reef-surrounded island, the airdrome program progressed most satisfactorily. The engineers, finding that the coarse coral sand of the island would be impossible to compact, borrowed coral off the shallow floor of the sea during low tide and surfaced the strip with pierced steel plank. The 5,000-foot runway received a crippled B-24 on 14 August and was ready for regulation landings three days later. The closer collaboration of Thirteenth and Fifth Air Force units fittingly gave emphasis to the great achievements which had marked two years of hard fighting in the South and Southwest Pacific. The campaigns in New Guinea, like those in the Solomons, had begun in desperate and essentially defensive attempts to check the enemy's advance toward vitally important Allied positions. 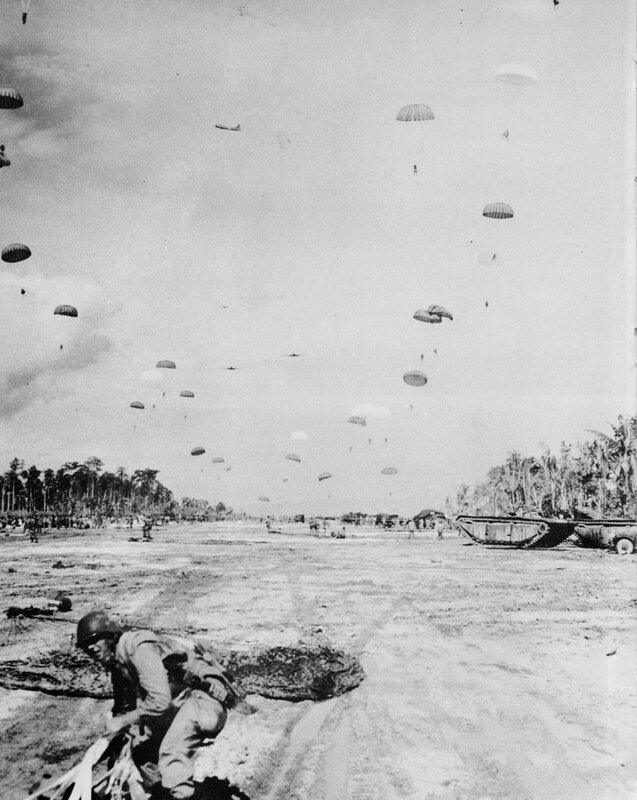 Allied air, ground, and sea forces--American, Australian, New Zealand, and Dutch--had wrested the initiative from the enemy, and advancing then along two converging lines, they now controlled the Solomons, the Bismarcks, and New Guinea. And the Philippines, where the earlier Far East Air Force had taken its initial defeats, would soon be brought within reach.